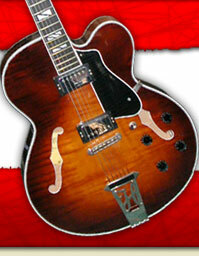 2006 Japan Terada produced Gretsch 6120-1959 LTV. Built to exacting `59 specs with Lacquer finish & TV Jones pickups. All the desirable `59 features, horseshoe headstock logo, zero-fret nut (at Chet's request), ebony fingerboard, Neo-Classic thumbnail inlays, B6C Bigsby vibrato tailpiece, and trestle bracing. Tru Arc bar bridge upgrade to suit 12" radius fingerboard.